Apr. 26, 2013 1:00 p.m. 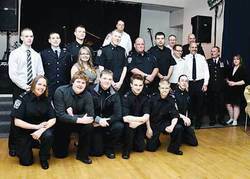 The 2013 Calmar Fire Department's officers and firefighters, at the Firemen's Ball. Calmar AB – On Saturday April 20th, Calmar hosted its 5th Annual Firemen’s Ball. All firefighters and Fire Department officers were proudly wearing their dress uniforms, and the Calmar Legion looked festive, fully prepared for a fantastic soirée, complete with a delicious and plentiful buffet prepared and served by Kosmos Restaurant of Leduc, a five-piece steel showcase band and a talented country dance band. The ball’s MC was Captain Ken Behiel, a five-year passionate ambassador of this fire department and the hard-working owner of Leduc’s Boston Pizza restaurant. A dynamic speaker, he also elicited a bit of emotion from the two hundred plus guests when he talked of various calls that make the duties of a firefighter worthy of admiration. He shared his pride in his department, citing the dedication that is required from volunteer firefighters, and the necessary and appreciated support of their families. He talked of his department’s growth in the recent past, mentioning several new additions to the roster, and welcoming the relatively new full-time Fire Chief David Brooks. Hailing from Valleyview, Chief Brooks is happy of this career and community move, and with his lovely wife Cassie and two small children, he is proud to now call Calmar home. A welcome addition to the Fire Department’s crew is Blaze, a ten-week-old chocolate lab pup who will be cared for by the firefighters and will live at the Fire Hall. Mayor Don Faulkner took the podium, greeting all and expressing his gratitude and pride in his growing fire department. Darlene Behiel, with her cohort Tracy Gordon, was proud of the success of this fifth annual event, citing the generosity of the Live and Silent Auctions’ sponsors, business operators from Calmar and surrounding area, including Leduc, Edmonton and Spruce Grove! The Live Auction Auctioneer, articulate and full of energy, was Richard Sawatzky who in fact is Nisku’s Adessa Auctions GM: his first duty was to auction off the first table to go to the buffet, a privilege that garnered $220: apparently, the MWG Trucking guests were a hungry bunch! MWG’s owner Mike Gordon was inducted as an Honorary Calmar Firefighter for his long-time support of the Calmar Fire Department. Congrats, Mike! “4’s a Crowd” is a fun and lively band hailing from Devon: it kept the guests hopping most of the night, playing a bit of everything. A demonstration of quickly donning firefighting gear was conducted with two rooky firefighters, tall young guys at 6ft 2” and 6ft 4”. They completed this critical task in 94 seconds, to the crowd’s delight and awe. Captain Behiel reminded the guests of the awards that were offered at Christmas time: Samantha Behiel who was about to turn 18, received the Fire Cadet of the Year, while Chris Hayduk was named Firefighter of the Year and Jason McKerracher was named Officer of the Year. KUDOS to these dedicated individuals! At the Calmar Firemen's Ball, the Dept's new mascot Blaze, held by Firefighter Jeremy Eigenbrood, enjoyed the attentions of the Pipestone Flyer's Linda Doerr.